Every. Single. Day last year, I would drop Lane off at preschool and Bethany would cry “It’s my turn!” Baby girl waited (somewhat) patiently and finally last week she got her turn! 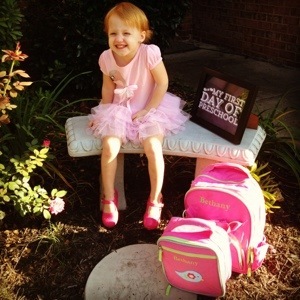 Bethany started school the Wednesday after Labor Day. She woke up so excited! Her backpack and lunch box were ready, clothes ironed perfectly and she even sat like an angel and took first day of preschool pictures! It was almost the perfect morning. Look closely at the precious little dress she is wearing – cute, right? My mom gave Bethany that dress for Easter or her birthday. She has HATED that dress since the moment she laid eyes on it. Hated. Trust me when I say I am not exaggerating AT ALL. Every time I have tried to get her to wear that dress, she has turned into a crazy Hulk Hogan wanna-be and tried to literally tear it off her body. But the dress has remained strategically in her closet. If you have a daughter, you know the joys of getting them dress. You iron the 5 million ruffles and then they try to refuse to wear the dress. So, being the gracious mother that I am, every time I pick out something for her to wear that she refuses I give her two clothing options: 1. the dress I picked out and iron 2. that flamingo dress. EVERY single time she choose the dress I picked out. Everyone’s happy. Off we go. Baby girl got to school and had an amazing day. She came home talking about her new friend Audrey. For over a week that was the only friend she mentioned. Finally this week she has started talking about another friend at school, Benjamin. 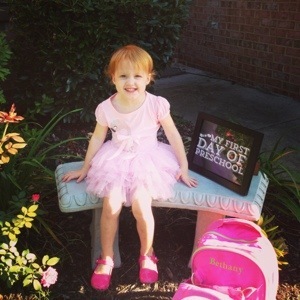 Her teachers are Mrs. Mindy (or as B says – Mrs. Minnie) and Mrs Holly (Mrs. HoYee). She loves them. School and the end of naptime are really wearing her out though! She also started gymnastics this week and loved it. Well, as long as you don’t actually call it gymnastics. She is very adamant that she does NOT want to do gymnastics. She does want to flip, swing, roll and walk on a balance beam. Oh the drama. 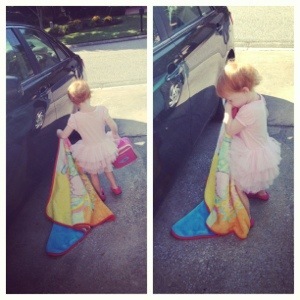 When she is not being dramatic, she can do some of the sweetest, most precious things. 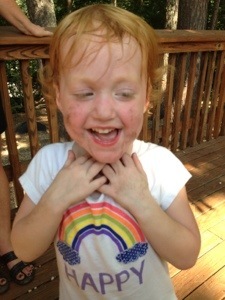 Here is a video of her singing a song she learned in Spanish class at preschool. 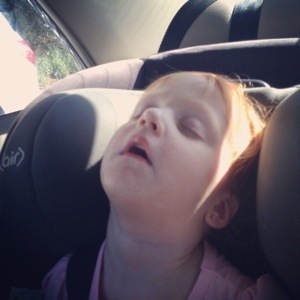 Here is a video of her “reading” her Jesus Storybook Bible in carpool. Her teacher’s described her well: “Smart as a whip and such a ham!” Right now she is obsessed with Cinderella and Paw Patrol. She daily asks if she can be either Cinderella, Doc McStuffins, or Skye (the pilot on Paw Patrol). A Princess, A doctor and a Pilot. 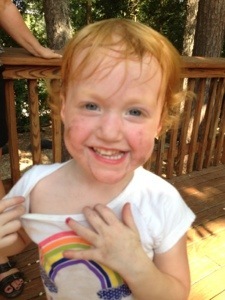 That is my girl: glitter and adventure. Pink nail polish and dirt. Beautiful and fearless. Pure happiness.